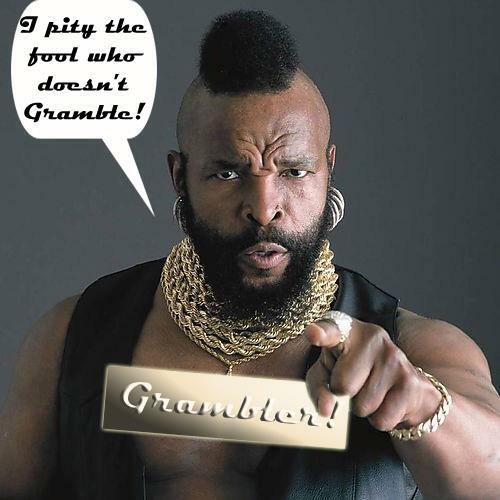 Should you feel the need to contact The Grambler for any reason, you can do so via Facebook and Twitter. Alternatively, you can email me at thegrambler@hotmail.co.uk. This little garden in Blantyre musta missed the invite. My goodness would I have lapped up some luscious little sandwitches loaded with appropriate stuff. So Mr Gramble, I hereby must say that this little event has to be advertised so one can visit for a peece. I don't recall any ads in any previous Grambles, or I'm just a lazy reader. So, get a peece made up and I will come up and visit with my donation. Only just read your comment re our Tea for Stewart. Sorry, you didn't receive an invite. We will definitely send you one for next year's event... Oh, hang on, you're anonymous. Might be difficult. PS. See you on the 20th at the MacFloyd gig. Hey all you gramblers out there. How would you like to be the proud owner of smart, stylish Grambler tee shirt? You would? Then go straight to http://www.redbubble.com/people/supergezza and make that purchase. All profits will go straight to the Bobby Moore Fund for bowel cancer research. And if you really want everyone to know that you support The Grambler, why not buy a few stickers as well. The Grambler is now on Facebook! The Grambler is now on Twitter! Week 1: Let's get ready to Gramble! Week 3: Deadline day drama for The Grambler! Follow The Grambler on Facebook! Some of the above may be ridiculously inaccurate. If you are offended in any way, bugger off. Awesome Inc. theme. Powered by Blogger.